teganography is the art of hiding secrets in seemingly harmless files to protect information. The point of steganography is the fact that nobody will ever try to look for the secret file that was created, because they have no reason to believe that it exists in the first place. The process of encrypting data typically produces chunks of illegible scrambled text, which can alert 3rd parties to the fact that data is in fact encrypted. It is often vitally important that business information remains invisible when transmitted. But sending visibly scrambled and encrypted messages can be detected easily. Steganography solves this problem because it hides your sensitive information within image files such as holiday picture. The hidden files can be of any type and the number of files hidden per image is not limited. The hidden files have multiple layers of encryption and it would not be practical for anyone to try and decrypt. Also a visual attack cannot be applied. This software can be used to store documents securely in one file. 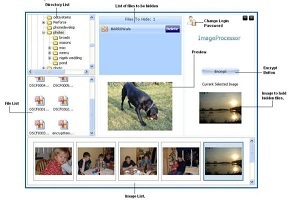 It could also be used to identify ownership of an image, by embedding a unique text file with owner details within the image or the owners logo. In fact giving the image a secret watermark or finger print. The files are first compressed and stored in a non-standard format. They then have two types of Encryption applied to the file. Next the file is encrypted again using a Unique password supplied by the user and finally it is encrypted again with a different key and merged with the image.The file created will look like any other image file and will be displayed as an image. When purchased the cost covers two licences for two computers.